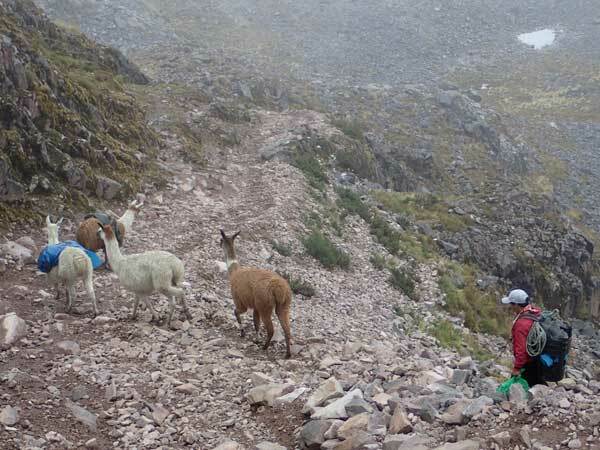 I had something to prove ... that we could hike over a high Peruvian mountain pass on our own, without a guide, but more importantly without porters, horses, mules or llamas. I also had a horrific cold, the kind when the phlegm you cough up is thick enough to chew. 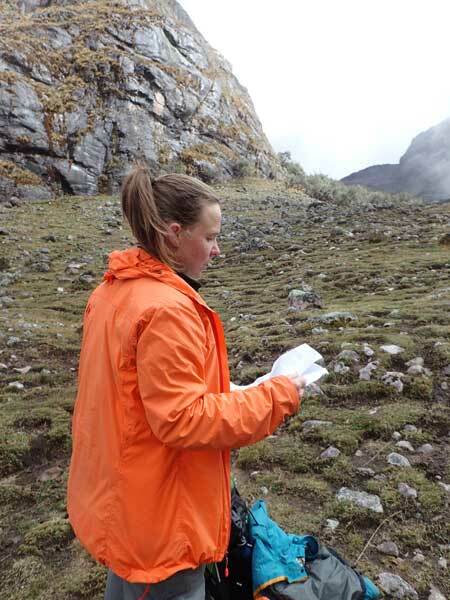 The choices were: go to bed for three days or hike to Lares. 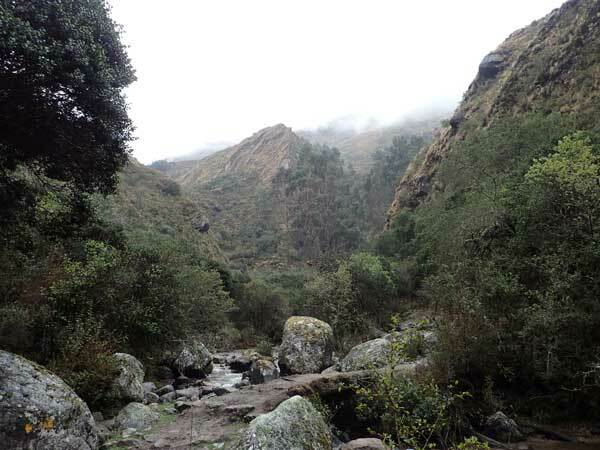 We chose a fairly quiet route, one described as 'strenuous' that follows an old Inca path. We had four and a half days available before we had to be back in Cusco for our trip to the jungle. I decided we would hike in (2 days), hike out (2 days) and go mountain biking on the fifth. Franco, as usual the voice of reason suggested that we might need a rest day after the hike in, but I wouldn't listen. We packed our bags and set off from Cusco. It was raining. 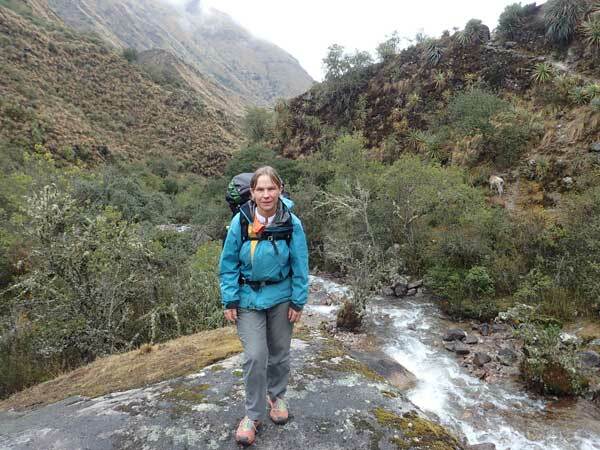 We arrived two hours later in Urubamba, in the Sacred Valley, the start of our walk. It was still raining. 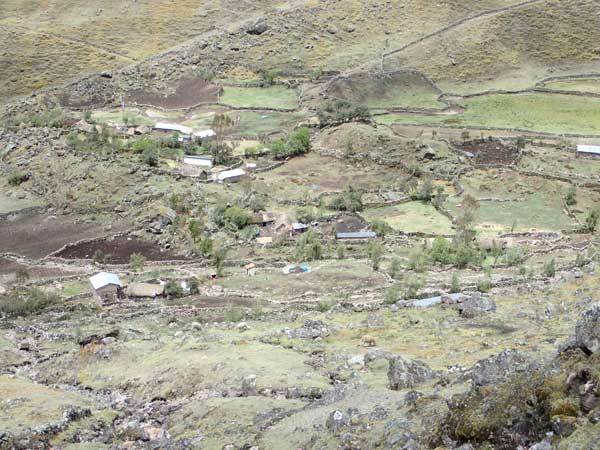 Our chosen route was through the Pumahuanca Valley, over the Pass of the same name and down to Lares on the other side. Pumahuanca is pronounced 'puma wanker', "a dangerous job for someone" as Franco joked. 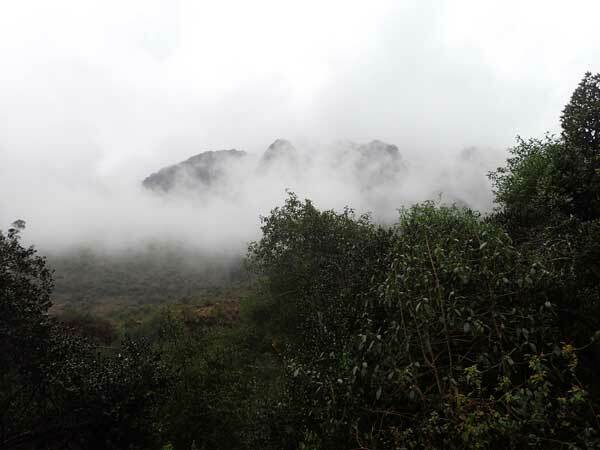 The rain wasn't heavy as we made our way out of town and up the gently sloping valley. 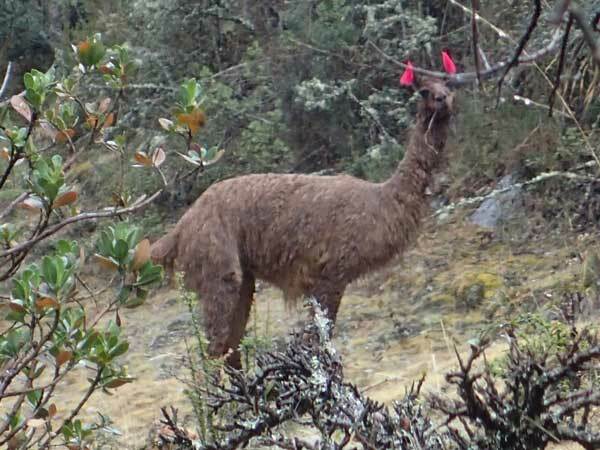 We caught up with a herd of llamas grazing along the path, several had brightly coloured threads of wool as earrings. 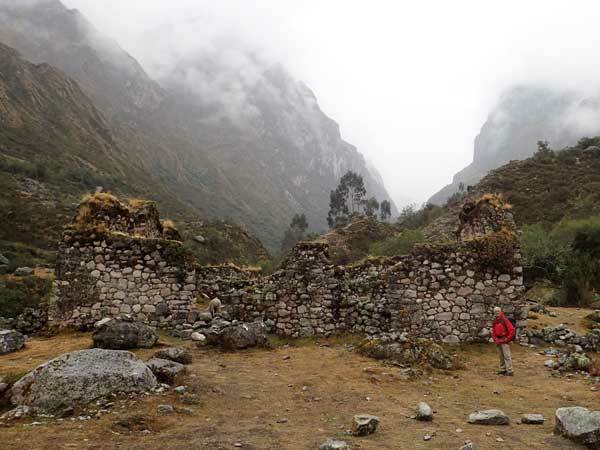 A little later we arrived at some Inca ruins but it was difficult to make head or tail of what had been what.We passed through a small community where most of the potatoes fields were left fallow and wondered how they made their living. A couple of little children came running out of a hut and watched us quietly as we walked on. We came across a campsite with toilets by a waterfall but it wasn't very appealing so we carried on to a clearing in the woods with a river running through. 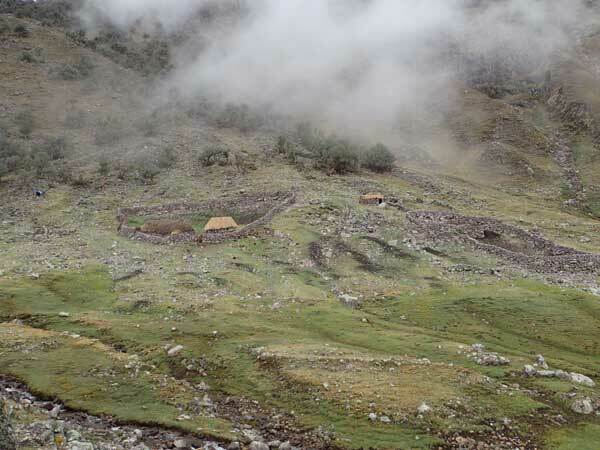 According to the guidebook author, this is one of the most appealing campsites in the world(!) but it was so infested with midges that we thought we had taken a wrong turn and were back in Scotland during the month of July. We ate midge flavoured instant noodles for dinner, with a cup of midge tea. While Franco washed up, I tried to fill our water bottles from the stream. There was nowhere convenient so I was hanging onto a bush while leaning over to reach the water. Of course, the predictable happened: I fell in. 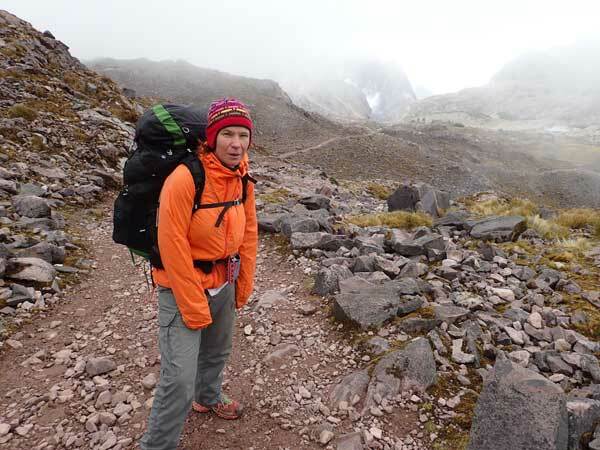 I was soaking up to the hips, a very bad idea at 4,700 metres in the Andes where the weather can turn bad any time. Franco helped me ring my clothes out and, since it was pitch black, we dived into the tent. It was only 6:30pm, the night would be long. In the morning the midges were back so we 'enjoyed' midge muesli with more midge tea before setting off. It looked as if the fog might lift and, forever optimistic, we thought the weather might be better on the other side of the pass. This, despite knowing full well that we were heading towards the jungle where it is much much wetter. As we climbed higher, every step became an effort as I struggled to breathe. By the time we neared the pass, I was crawling along and Franco was having to wait for me regularly. A pack of mules came down the path followed by a pack of llamas. 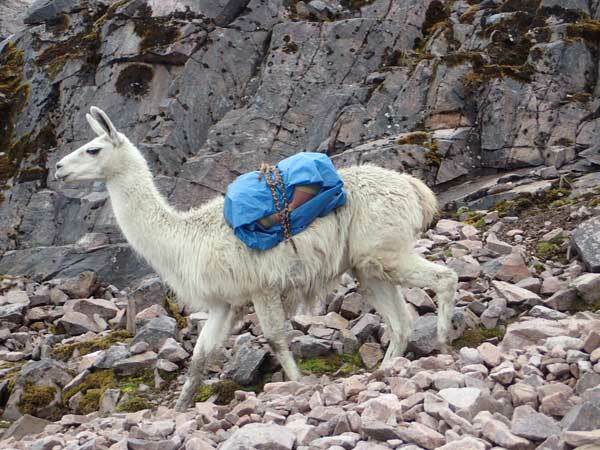 It was the first time that we saw llamas carrying gear. 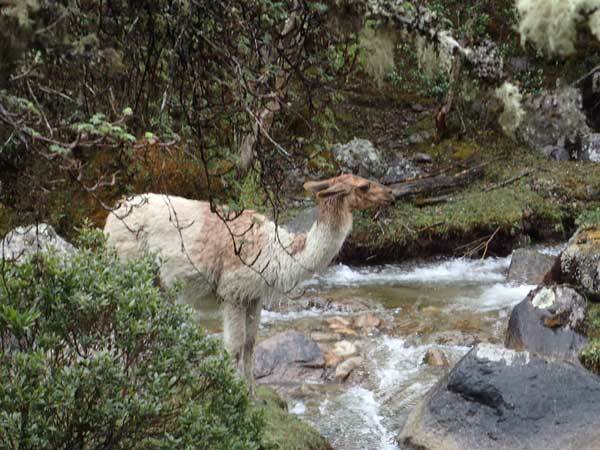 The llama driver told us that they can carry up to 10kg. Ahead in the gloom, we could hear what sounded like someone blowing a conch shell. We speculated that it must be some tourist trying to create a mystical experience at the top of the pass. 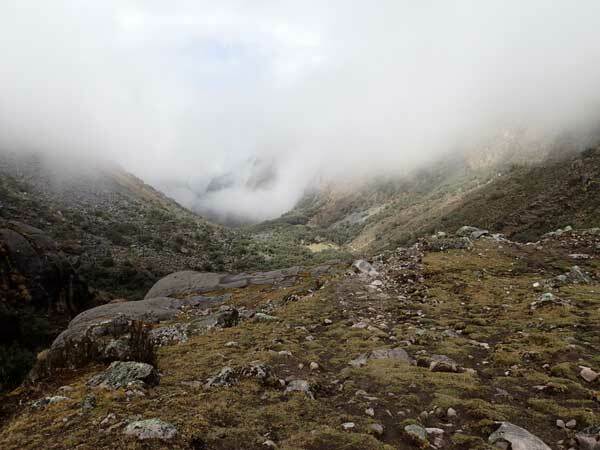 The noise got closer and out of the fog appeared a couple of Peruvian men, one was blowing an oxen horn. He blew again but all that came out was a squeak and his friend giggled. He explained to Franco that his mate was appeasing the spirits of the mountain so that it wouldn't snow. The horn player looked terrified, he genuinely hoped that his actions would have some impact. The weather was truly foul and we piled on the layers before the top of the pass where it was snowing heavily. The weather was no better as we headed down on the other side. We hoped the temperature would warm up as we got lower down so we continued until we reached some lakes before stopping for lunch. It was a little warmer but frequent rain showers kept coming through. 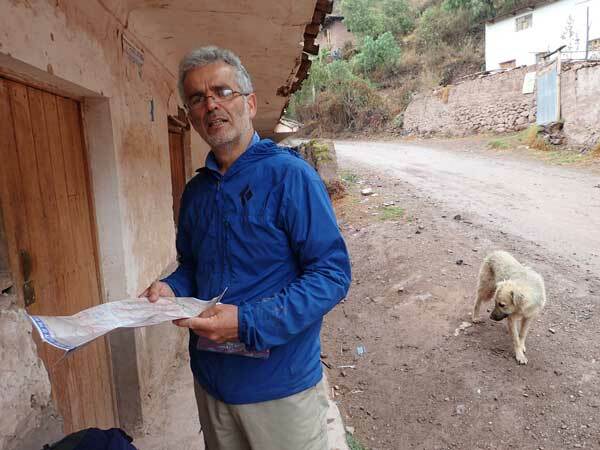 After some more downhill walking, we reached the village of Cuncani and celebrated by eating our small bag of dried fruit, thinking we had nearly arrived in Lares which is only 9km downstream from Cuncani. We realised many tiring hours later that the measurement given is as the crow flies and that the true distance is a lot further. 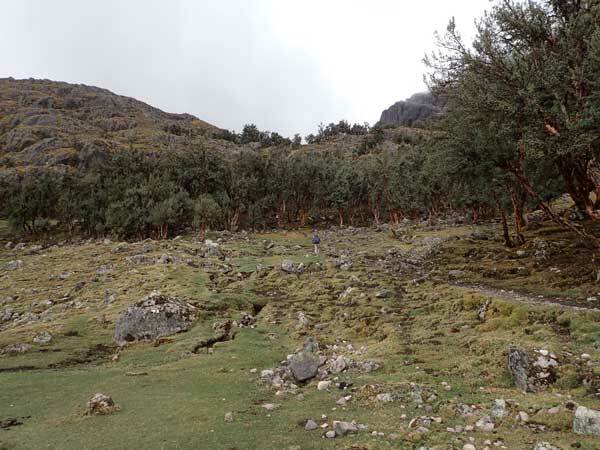 As we walked through outlying settlements, we were surprised to pass locals only wearing the usual layers of woollen clothing and no waterproofs. It was raining steadily and despite our good quality raincoats we were damp. At last we arrived at the Lares thermal baths and enjoyed a good soak. We made our way into town, fifteen minutes further on and stopped at a 'café' for a bottle of Coca-Cola. The river down from Cuncani is full of rubbish and we hadn't fancied drinking from it, not even purified with our UV filter pen. We had crossed over a high Andean pass under our own steam and made it to Lares, achieving what we had set out to do. 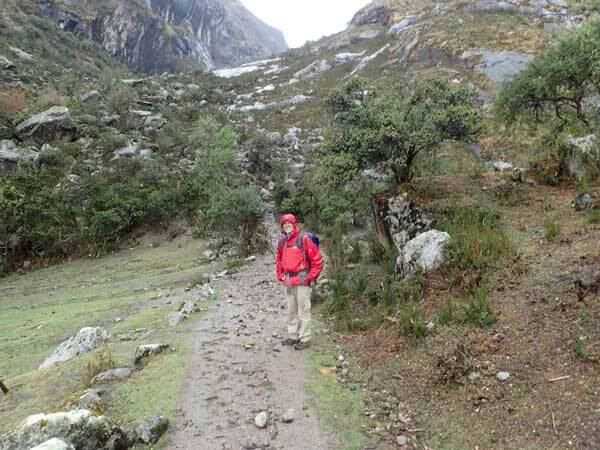 One option was to trek back to the Sacred Valley via another route but the weather was still bad, and as the baths attendant had told us it would only get worse as we headed towards the wet season. My cold hadn't improved and we were both fairly tired, Franco had been right, we needed a day off. 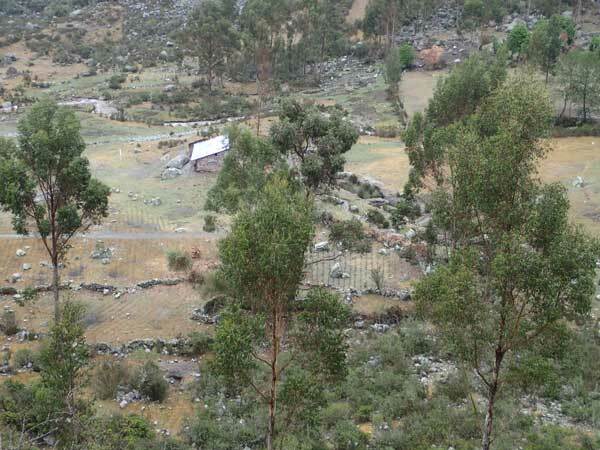 We made enquiries, a minibus departed at 7:30am the next morning, along the new road over the mountains, back to the Sacred Valley. The ticket lady told us: You must arrive at 7am." "Seven Peruvian time," we chuckled. "It must be a way of getting passengers to turn up earlier than they otherwise would." We booked into a hostel and went looking for somewhere to eat. I felt bloated after drinking the coke and didn't particularly fancy supper. The few restaurants in the village all did the usual set meal: soup followed by some kind of meat with rice and potato chips and a mug of hot tea. It tasted ok but the rice was cold, possibly leftover from lunch. As we settled down for the night, I had a sudden urge to vomit, the bathroom was occupied, but luckily I found an empty rubbish bin, only it had a whole in the bottom. I made several trips to the bathroom that night but luckily by the morning was feeling a little better. A good thing since we had a four hour minibus journey ahead of us along a very twisty road. We wondered what had poisoned me, Franco was fine and we had both eaten the same food. I had started feeling strange before dinner, so maybe it was from the thermal bath water, run-off from the road was contaminating the hot water pools. We wandered into the square at 7:05 expecting a long wait but all our fellow passengers were already seated, we were the last to arrive. The driver got in and we set off before 7:10. We'll never get the hang of Peruvian timekeeping. Our driver was the best we had met so far, lucky really as the road was very narrow and windy. A few hours later we were back in the Sacred Valley. We caught another minibus back to Urubamba where we changed for Ollantaytambo.